Flooringsupplies.co.uk have been granted chain-of-custody certification by SGS, who provide certification & verification services to ensure that products, services & systems meet quality, safety & performance standards. 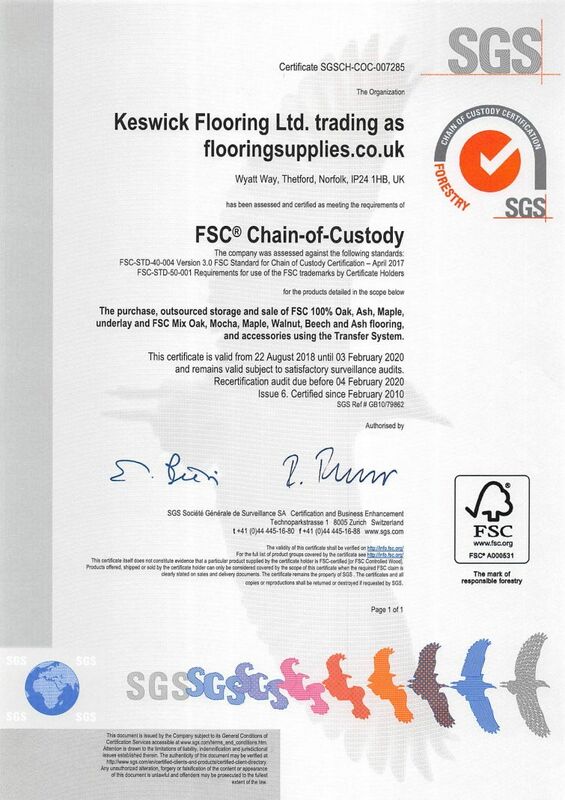 To acquire this certification, Flooringsupplies.co.uk were independently certified in accordance with the rules set by the Forest Stewardship Council (FSC). Flooringsupplies.co.uk are very proud to achieve this status and feel its important for all flooring manufacturers and suppliers to consider our environmental responsibilities and to do our utmost to ensure we all commit to adhering to the values that FSC work so hard to protect. Flooringsupplies.co.uk are pleased to achieve this high standard. Already, approximately 50% of the Nätura engineered range are FSC certified as well as some Kahrs engineered products, along with many accessories. 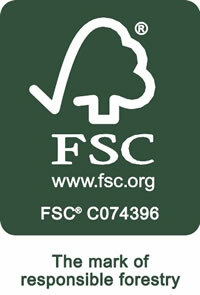 We are already working with suppliers to increase this number to eventually supply 100% FSC certified products. View our ranges of environmentally friendly wood flooring and environmentally friendly laminate flooring. How will I know if I'm buying green flooring? One of the easiest ways to tell if the wood floor you are buying is classed as green flooring is to look for certification from the Forest Stewardship Council (FSC). In order to achieve FSC accreditation, retailers, suppliers and manufacturers have to meet rigorous standards relating to the management of the forests from which the wood is taken. FSC flooring products are internationally recognised as meeting these exacting standards and treating the environment responsibly. An extensive audit process was undertaken before Flooringsupplies.co.uk was allowed to sell FSC flooring, but now approximately half of our Natura range of engineered wood floors is certified by the FSC, as well as a number of Barlinek engineered products. FSC flooring will feature the organisation's logo, so you can quickly tell if the product you are considering is environmentally friendly. Why should I buy FSC flooring? With more and more pressure being put on the world's natural resources, we should all play our part to help where we can. Buying FSC flooring is just one way in which you can help safeguard the environment for future generations by ensuring that the timber used comes from a well-managed source. The wood used for FSC flooring will come from a sustainable forest, which means new trees are planted to replace those that are felled. With wood flooring becoming an evermore popular option, it is increasingly important for people to choose green flooring products. The Forest Stewardship Council is an independent, non-governmental, not for profit organisation created to promote the responsible management of the world’s forests. FSC is a certification system that provides internationally recognized standard-setting, trademark assurance to companies, organisations, and communities interested in responsible forestry. Chain-of-custody is the route taken by raw materials from their source to a final product, ready for sale to the end user. Each process on the route has to be undertaken by certified members to ensure the chain is not broken. This includes forests, processing, manufacturing and distribution. Each member has to go through extensive auditing to ensure their practices are within the requirements of the FSC standard. As a retailer we have been independently verified for Chain-of-Custody certification and now eligible to label our eligible products with the FSC logo. Flooringsupplies.co.uk works very closely with all partners to act appropriately with regards to environmental awareness. Our simple code of practice is designed to work in harmony with Mother Nature, complementing natural products, and materials always with an appreciation of the environment. Flooringsupplies.co.uk philosophy and mindset is determined to promote and educate manufacturers and consumers alike on environmental issues. Believe it or not there are huge benefits of choosing environmentally friendly flooring. Far less energy is consumed in timber production, processing and disposal, than in any other construction material. Today, because the popularity of real wood flooring has grown, so too has the commitment to vigorous replanting schedules and responsible harvesting. More trees are grown than are currently harvested so inadvertently increased demand has had a positive effect and impacted on our environment and natural timber flooring resources. To fall in line with the above, Flooringsupplies.co.uk work to a strict code of practice when sourcing materials, which all manufacturers we work with must abide by before we would consider offering their products and services. The PEFC Council (Programme for the Endorsement of Forest Certification schemes) is an independent, non-profit, non-governmental organisation, founded in 1999, which promotes sustainable managed forests through independent third party certification. The PEFC provides an assurance mechanism to purchasers of wood and paper products that they are promoting the sustainable management of forests. Eco friendly homes are becoming more popular, especially with various tv programmes highlighting the move towards renewable sources and self sustainability. We can all do our bit towards green living, with recycling and energy efficient alternatives, as well as choosing floors that are produced in eco friendly ways, such as replanting many trees for each one cut down, or using waste wood to power operations, or indeed towns! Deliveries are calculated by weight and delivery location. We work very closely with all delivery partners to maintain competitive delivery costs at all times. However, this partnership is built on more that just price. We have to consider reliability, care, insurance, service level, practicality and lastly environmental impact. To assist with all the above we encourage our customers to accept deliveries in certain areas on certain days. With this very simple and cost effective policy we have helped to reduce our carbon footprint considerably. We have looked into ways of improving in-house wastage and simple cost effective procedures like recycling our paper have a big impact. We have reduced printing requirements by 90% by simply emailing invoices instead of printing and posting them. We also encourage others to follow suit with our email disclaimer which requests our email not to be printed unless entirely necessary. Staff encourage manufacturers and consumers alike to share our policies wherever possible with simple but effective use of email technology by requesting that all invoices, statements and communication is to be done by email. We also encourage all payments to be made electronically. Employees and management are encouraged to make appointments utilising public transport and lift shares to and from work are also implemented. We all have a responsibility to look after our environment. every little helps!